Her socks are never quite alike. I ran away for real. Tabi are Japanese split-toed cotton socks. They fasten at the back with metal tabs and cotton loops. Traditional Japanese footwear are geta and zori sandals. These have a thong between the big toe and the other toes. So a split-toed sock was necessary in the winter. Incidentally the casual flip-flops and thongs worn all over the world were apparently developed from Japanese zori sandals brought back to the USA by members of the armed forces after World War II. Tabi are sometimes worn in the martial arts. For example they are worn in kyudo - Japanese archery. They are also worn in formal demonstrations and in cold weather in kenjutsu - the sword - and in iaido - drawing the sword. I have seen aikido instructors wearing tabi but usually it was because of an injury. The soles of tabi are very thin so contact with the ground is excellent. The toe separation means that the power of the big toe can be transmitted easily. They are very comfortable to wear and give a subtle support to your feet. Minimalist shoes are based on a similar concept. White cotton tabi are worn with formal Japanese kimono. Men might wear dark tabi with everyday kimono. 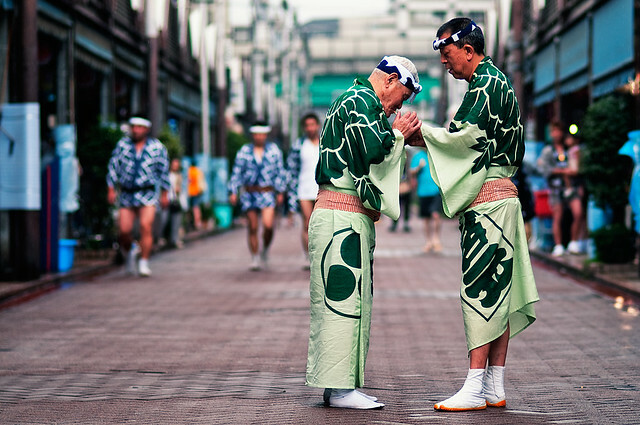 Except for sumo wrestlers and kabuki actors men do not often wear kimono in Japan. A few young men wear them for January coming-of-age ceremonies and for their own wedding ceremonies. But many Japanese women still wear kimono instead of western dresses or suits for special occasions. With kimono they wear white tabi with zori sandals. In recent years casual kimono and patterned tabi have become popular with a few young Japanese people as a niche fashion statement. Some cities have kimono days when you can get discounts if you are wearing kimono. I'll come back to kimono in more detail another time. Stronger jika-tabi became popular as work footwear in mines in Japan. Now they are worn by many construction workers and people who have to work outdoors. These higher canvas boot-style tabi with rubber soles were introduced by the Ishibashi family. This family was famous for rubber because of Bridgestone tires. Ishibashi means stone bridge. The mother of Yukio Hatoyama, Japanese prime minister from 2009 to 2010, came from this family. The jika-tabi give very good control and sensitivity but poor protection against injury compared to work boots with reinforced toes. You can also see them at traditional Japanese festivals and on the men who pull rickshaws in tourist areas like Kyoto. Tabi should be a close fit. If they are too large your feet can move inside. So when you buy tabi they recommend you get them half a size smaller than your normal shoe size.